Never drive sleepy. If you have heavy eyelids, you are not fit to drive. 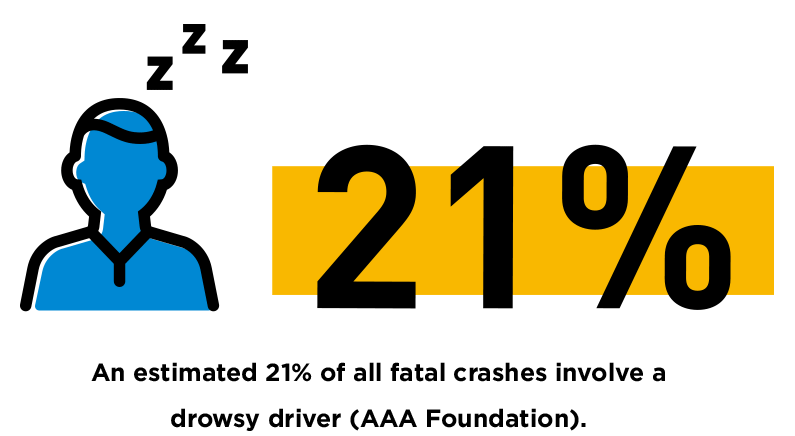 Drowsy driving is at least as dangerous as illegally driving under the influence of alcohol (Powell, Schechtman, Wiley, Li, Troell, & Guilleminault, 2001). Staying awake for 19 hours produces impairment similar to having a BAC of 0.05. Being awake for 24 hours is comparable to having a BAC of roughly 0.10 (Dawson & Reid, 1997). If you find that you are too sleepy to drive, the best thing to do is get a full night’s rest. If that’s not possible, take a 20 minute nap or drink 2 caffeinated drinks (each with as much caffeine as a cup of coffee). Powell, N. B., Schechtman, K. B., Wiley, R. W., Li, K., Troell, R., & Guilleminault, C. (2001). The road to danger: The comparative risks of driving while sleepy. The Laryngoscrope, 111(5), 887-893.